With the rising prices of homes leaving buyers high and dry and the result being thousands of completed but unsold projects, builders have come up with a plan that they hope will salvage the situation. Now, they are pricing ready-to-move-in apartments in the affordable price range thereby enabling buyers to buy their unsold units. Data collected by Anarock Property Consultants shows that in the top seven Indian cities, there are 6.73 lakh units of unsold housing inventory. Approximately 85,000 units out of these fall into the ready-to-move-in category. Almost 60 percent of these units are priced in the affordable and mid-segment categories. The cost of any apartment under this range is under Rs 80 lakh. The biggest draw and attraction for homebuyers for completed projects is that once the completion certificate is received by the builder and a home is booked after that, they do not have to cough up an additional 12 percent Goods & Services Tax (GST) for the home and there is no endless waiting period to move in. This is why, the majority of end-user, as well as investor demand, are bent heavily towards affordable and mid-segment apartments. 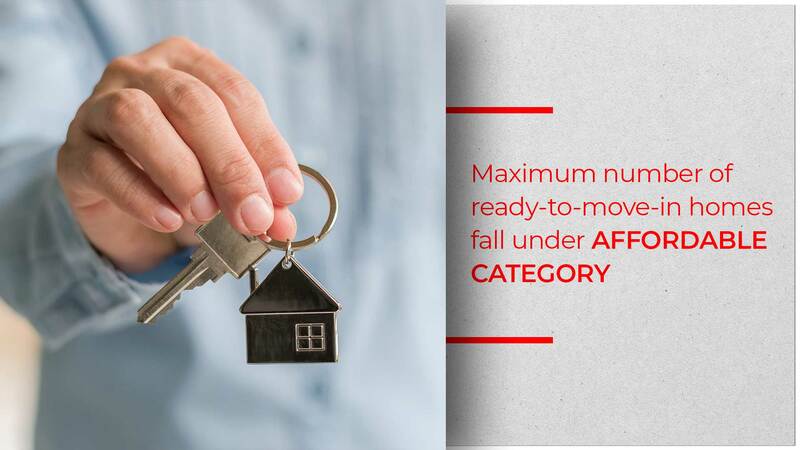 According to a survey carried out by Anarock for the time frame between June 2018 till December 2018, nearly 67 percent of aspiring homebuyers chose to purchase homes in the affordable price range. Anuj Puri, chairman, Anarock wasn’t surprised with the results of the survey. He further stated that most of these properties actually do offer a good value proposition with the least amount of risk. “The only thing buyers should pay attention to is that a ready-to-move-in property must have a completion certificate to get the benefit of the 12 percent GST exemption,” Anuj said. In the past, there was a massive price difference between ready-to-move-in and under-construction properties. However, that is not the case any more thanks to the enormous unsold stock in most cities. But the additional GST charge on under-construction projects does add to the final cost. Mayur Shah, managing director, Marathon Group stated that the real estate sector is a volatile one. It is this very reason why buyers choose the lesser riskier options.